How to install Kodi VPN addon on Fire TV Stick or Android 2018 for free on version 17 or 17.6 Krypton. No root is required on the device for this to work. If you have an active Kodi installation on an Android device which does not have access to the Google Play Store, or for that matter are using an Amazon Fire TV / Stick and use it regularly to watch TV shows or movies, then the chances are that you will probably want to afford with a level of protection to obfuscate your identity as best possible. 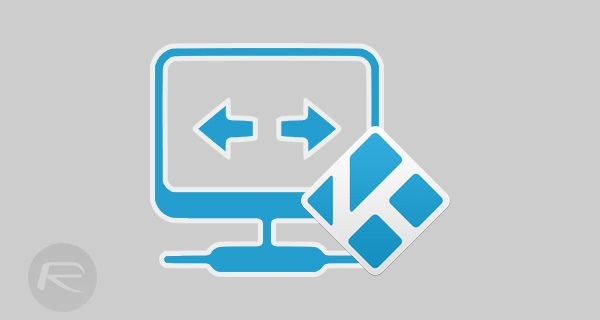 Step 1: Within the Kodi installation head into the File manager area, You are then going to need to select Add source. Step 3: At the bottom of the window you will be asked to enter a name to define the media source. Simply enter .kobra and then select OK. Step 4: Head back to the main home screen of Kodi and select Add-ons and then Install from zip file. 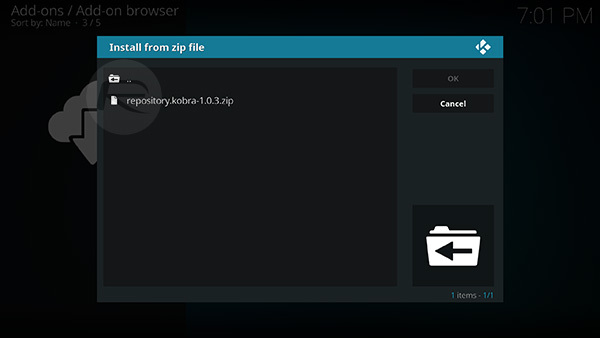 Step 5: Select the .kobra source, and then select the repository.kobra-1.0.3.zip file found within. Wait for Kodi to show an alert banner telling you that the kobra repository add-on has been installed, and then proceed with the next step. Step 6: Now you need to select the Install from repository option from the Add-ons menu. 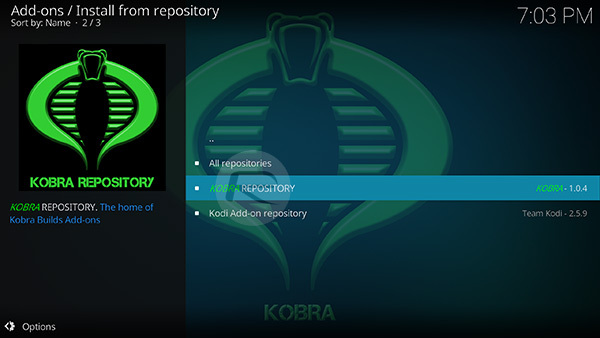 Once installed, You will find one in that list called KOBRA REPOSITORY. Select that. 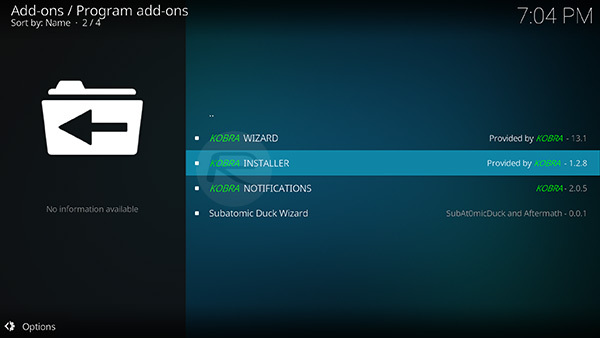 Step 7: Select Program add-ons and then select the KOBRA INSTALLER option. 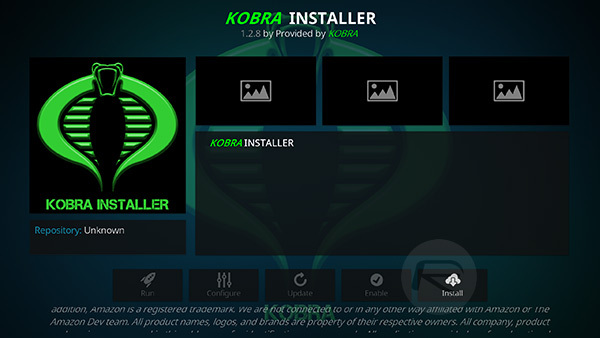 Step 8: Simply hit the Install button and you will once again see an alert banner telling you that the KOBRA INSTALLER has been installed. 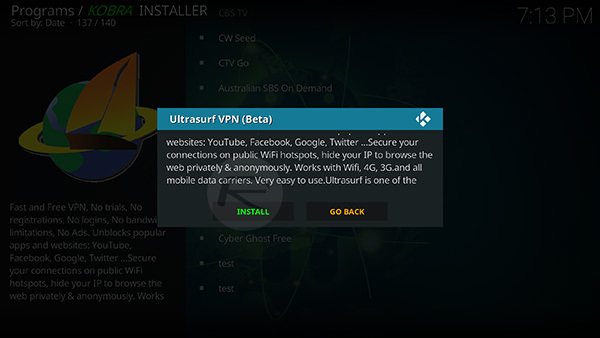 Step 9: Once again, tap the KOBRA INSTALLER option, hit the Open button followed by selecting the Apps folder, locating the Ultrasurf VPN (Beta) app and selecting it. 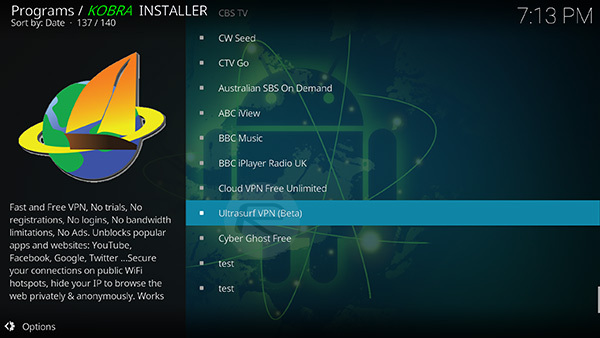 Step 10: Once you have selected the VPN you will be asked to confirm if you wish to install the app. Select INSTALL to continue. 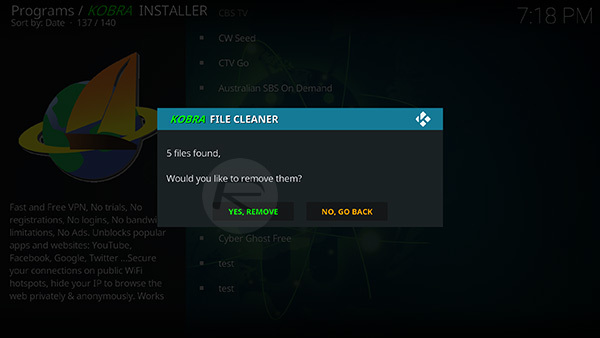 Step 11: You may be asked to allow KOBRA to delete certain files. Make sure you allow it to do what it needs to do. 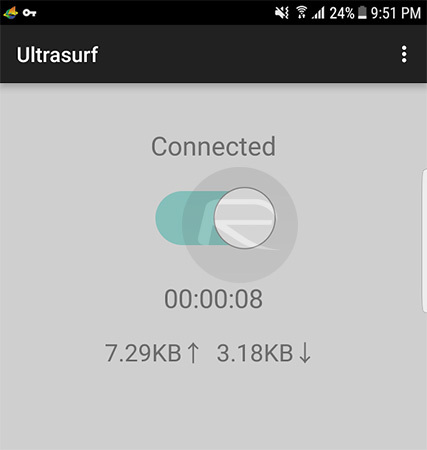 Step 12: Once the files are deleted, simply launch the newly installed Ultrasurf app, and flip the switch to the On position to connect to a free VPN. This process works perfectly well for those with a Kodi installation on an Android device without any access to the Play Store or the likes of the Amazon Fire TV or Fire TV Stick. However, if you do have the Play Store installed on whatever device you are using, then you can actually just grab the VPN installation directly from the store itself as a standard Android app installation. Wow. This is by far the worst way to install a VPN app that I’ve ever seen. You can literally just push the APK to your device, the same way you pushed Kodi, if you don’t have the play store. You can also do it from ES File Explorer. Neither which require installing a repo via Kodi to accomplish. So this doesn’t work ? Curiosity. It works. It’s just the unnecessary way to do it. Over-complicated, when there are much easier methods that require less writing and steps, lol. Just out of curiosity wouldn’t going the repo method allow for auto updates through Kodi? Ok, can anyone please confirm if this “free” VPN actually removes geo-locking once installed? Allowing more region-lock content to be played? Is there a way I can use one much easier methods ? A free VPN app, where ? We would like to know, thanks Timmy. i think that only works if the repo had an actual kodi addon eg exodus or navi-x, but this is just an android apk. from what i know kodi doesnt autoupdate apks. most vpns will do that, yes. free ones like the ones he mentioned or hss, or the paid variety like ivacy. (y) just be sure to check your ip after changing the region bro to make sure the system is indeed showing your new ip (assigned by your provider). Tim’s right about over-complicating it. The steps are a bit complicated but all in all a well-done guide. I can do this. Thanks. Thanks LeopoldT. Just wanted to confirm, before messing with my setup. Appreciate the feedback. Do i have to connect this everytime i use kodi? Didn’t work. Does not connect from add source. no you won’t have to redownload the whole thing. that would make it really hectic and inconvenient. one way to make it less fussy is to configure any vpn like ivacy or nord or vypr over your router first, everything else connected to that router will automatically be behind the vpn since every bit of data is coming through the router. I’ve clicked to open .kobra but it’s not opening to the 1.0.3 zip, why is it not opening?